My mom’s friend has become my friend on facebook. It is quite a thing this social networking. I am slowly becoming better at it. However, I have hidden my facebook profile so that ex school ‘friends’ cannot find me. I reckon that after 30 years if I have not spoken to someone they are really not my friend! I am a JD Robb fan and she writes books set from 2058 onwards. She talks of off planet which are the inhabited planets other than earth. Dave and I live off planet as far as some of our family is concerned. So, facebook is a great way for me to know which cousin is pregnant, which nephew is in a relationship and even maybe soon which niece is getting married. I am facebook friends with quite a few bloggers, some of whom I have met in real life, and others who are just a status line on my wall. I consider each of these friends important as I ‘talk’ with them everyday. So, back to my mom’s friend. Carol and Michael used to live in South Africa and I have had the pleasure of eating at their table. They now live in London, and Carol shared this recipe for mixed mushroom ragu with me. I have changed it a bit from the original: I did not have onions and I used Port instead of Sherry due to my sucrose intolerance. 350g mixed mushrooms, sliced – you can use button, chestnut mushrooms, oyster mushrooms, shitake etc. I don’t often use oyster mushrooms, I usually mix button and chestnut, or even just chestnut. I also don’t always reduce the liquid because it is rather nice when it is a little bit more runny. Port and Mushrooms…. you can’t go wrong! Love it! I love mushrooms…this is a great one. Given that I’m heading out to the farmers market tomorrow morning, I’m hoping to find some wonderful local mushrooms to make this. It has me drooling. I am fairly new to the whole facebook thing myself but to date have enjoyed re-connecting with some old school mates but use it mainly for my blog posts and motivational quotes that I post every day. 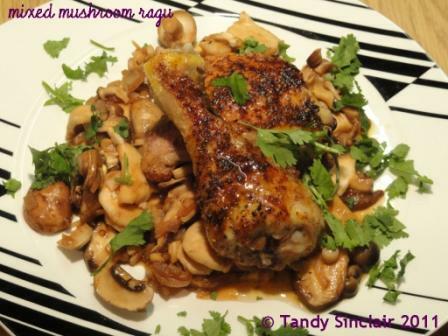 I am loving this recipe – anything with mushrooms is a winner in my book. This looks wonderful! I love the port and spicy ingredients with the Asian flair. Very cool. I love mushrooms and this looks delicious – perfect as we move into fall here. I enjoy facebook but unfortunately don’t have much time to spend on it!! I love the ragout – great, as always! Oh yum, I agree with Yvette- that would be tasty in a risotto! I really like the idea of that! I agree with what you say about friends you haven´t seen or spoken to for 30 years. I sometimes receive messages from old school pals, but am never tempted…what would we ave in common after so much time apart from school? Funnily enough though, my very best and dearest friend is a school pal…we have been friends for over 35 years! I went to school with some of the bitchiest people I have ever come across – and to be judged by them is not on my list of things to do!